Between laughter, woozy instrumentals and joyous, stop-start rhythms, Weaves has an undeniable feeling of fun surrounding it. As a debut, it perfectly captures the band's personality and sound: captivating, incomparable and deliciously unique. Weaves can flick between breezy, cute pop hits to tight-fisted punk snarlers in the blink of an eyeball, and the record's best tracks are a combination of both. Both deliciously raucous and whimsical, Weaves’ ‘wonky-pop’ debut is a whole lot of fun. Weaves’ music is difficult to pin down, yet undeniably memorable. A distinctive wonky guitar sound, commanding vocals, and disobedient rhythms create something beautifully unhinged and challenging. There are no ballads or down-tempo tracks here, so on one hand it may lack dynamics, but it also works in Weaves’ favour to keep the momentum going. Constantly fun, they feel like a band on the launch pad. For all of Weaves’ admirable attempts to poke and prod indie rock towards progress, the irony is that they still sound like a throwback. Their proper, self-titled debut will turn off some listeners due to its raggedness, but those willing to dive in will find plenty to sink their teeth into. So much is happening in each trebly, dizzying track that there are few new heights to reach after the first three or four. 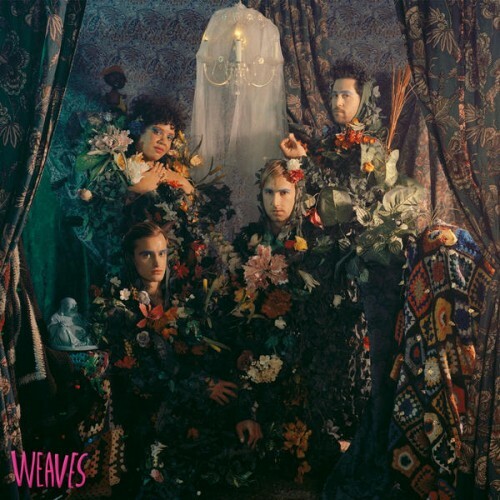 Weaves have written a good debut record that is unafraid to take chances, and to an extent, it signifies a band that will only get hungrier with time. They're still in search mode, though, exceedingly pushing themselves to write clever pop songs that sometimes expose their calculated overconfidence. There might be a good band lurking within Weaves. They just need to decide what exactly they are. Purchasing Weaves from Amazon helps support Album of the Year. Or consider a donation? New Track: Weaves – "#53"